We’d love your help. Let us know what’s wrong with this preview of Fangs & Fins by Amy McNulty. High school senior Ember Goodwin never had a sister, but after her mom’s remarriage, she now has two. The eldest is no stranger to her—Ivy is a witty girl in her grade who’s almost never spoken to the shy bookworm before—but she’s surprised to A dapper vampire. A sullen merman. Two heirs to a great conflict—and each needs to claim a beloved to become his kindred’s champion. To ask other readers questions about Fangs & Fins, please sign up. Fangs and Fins is a great read. It’s unpredictable, and will keep you wanting more! The storyline was well written, and I immediately fell in love with all the characters! This book was provided by the author in exchange for an honest review. Thank you Amy McNulty! Fangs & Fins is such an interesting concept! I really like that there are vampires and mermaids in this book. 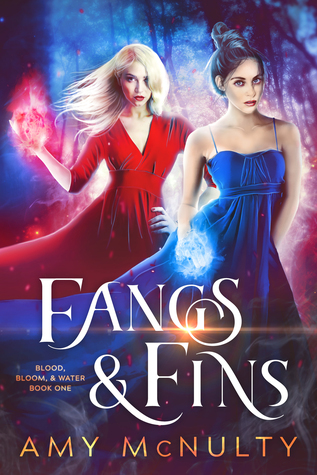 I’ve never read about these 2 creatures combined in 1 book so that made Fangs & Fins definitely original! I liked the main characters, Ember and Ivy, because they were both opposites but at the same time they weren’t a bit shallow. It felt like the characters weren’t really persons and I couldn’t connect with them. I had the same feeling with Dean and Calder, they both seemed great but they weren’t that deep. The story itself was interesting but slow-paced. I had a hard time reading this book because the writing style just wasn’t my thing and I didn’t always like the double perspective. Sometimes I didn’t want to read in Ember’s perspective or sometimes I didn’t want to read in Ivy’s perspective. I just wasn’t feeling the characters. Two heirs to a conflict that has lasted generations, one a dapper vampire and one a sullen merman, each needing to find a beloved to become his kindreds’ champion. After her mother’s remarriage, high school senior, Ember Goodwin, suddenly finds herself with not one but two stepsisters, after spending her entire life as an only child. She’s familiar with the older of her new sisters as they both attend the same high school. Ivy is a witty, popular girl in the same grade, who’s never really spoken Two heirs to a conflict that has lasted generations, one a dapper vampire and one a sullen merman, each needing to find a beloved to become his kindreds’ champion. After her mother’s remarriage, high school senior, Ember Goodwin, suddenly finds herself with not one but two stepsisters, after spending her entire life as an only child. She’s familiar with the older of her new sisters as they both attend the same high school. Ivy is a witty, popular girl in the same grade, who’s never really spoken to Ember, so Ember’s a little surprised to find that she’s friendly and they seem to get along. Their blossoming friendship is quickly put to the test when Dean Horne, a pale somewhat old fashioned new student in a suit, initially shows interest in both girls, planning to reveal his taste for blood to the one he chooses to stand by his side as champion. Seventeen year old Ivy Shepherd is beyond tired of splitting her time between her divorced parents’ homes, especially after her father remarried and moves to his new wife’s home. But, she decides to try and make the best of it by becoming friends with her nerdy new stepsister. Her life becomes even more stressful when she catches the eye of junior, Calder Poole. She’s convinced that she saw him with a mermaid tail, where his legs should have been. Now she finds herself with more than enough suitors and trying to discover the truth about the strange events that are happening around town. This is the first book in Amy McNulty’s “Blood, Bloom, and Water” series, but not the first book I’ve read by this author. Nor will it be the last. Once again, she’s created an amazing storyline that has the perfect amount of action, drama, emotion, and conflict with a bit of romance thrown in. In this story, family is pitted against family and friend against friend as a quiet, small town finds itself the setting of an ancient war coming to a head. Amy did such a great job with her characters and manages to alternate points of view between Ember and Ivy, giving both girl a distinct voice of her own as she tells her side of the story. She does an excellent job at showing the inner turmoil both of them are feeling as they each try to figure out what the right thing to do is while also trying to stay loyal to each other, trying desperately not to let this ancient war keep from splitting their new family and their newly formed bond. Honestly, this story is amazing so now there are two series that I’m going to have to nag for sequels to. Thank you so much to the author for a copy in exchange for an honest review, I really do appreciate it! So I have been a fan of Amy McNulty and her work for a few years. Since I have read Never Veil, I have just loved all of her writing so I am so glad there is yet another YA series for me to love because reading YA is definitely my addiction... I just can't help myself! I had no idea what to expect with this book, but I am very pleased overall. I have never heard of a vampire vs merfolk story so Thank you so much to the author for a copy in exchange for an honest review, I really do appreciate it! So I have been a fan of Amy McNulty and her work for a few years. Since I have read Never Veil, I have just loved all of her writing so I am so glad there is yet another YA series for me to love because reading YA is definitely my addiction... I just can't help myself! I had no idea what to expect with this book, but I am very pleased overall. I have never heard of a vampire vs merfolk story so that alone caught my attention. I am one who enjoys vampires... have never read too much about merfolk, but I do like the direction this series seems to be going. I devoured this first installment quickly, and I look forward to more in the future. Ember and Ivy are new step sisters. Their parents have married quickly and now they are family. They seem to get along well. And then there is a new guy in town who catches both their attention...and someone else who also does. All of the sudden, there are cute guys who want the attention of the sisters. And it is about to get a lot more complicated when they find out who the guys are and what they intend for the sisters to do for them. Just... wow. I was enthralled this whole time because I have to admit, I liked all of the characters for various reasons. Ember is so sweet and I could relate to her wanting to fit in. Ivy is strong willed, and I could also relate because I can be the same way at times. I love how I could connect with both sisters for different reasons. I don't find that too much in books so I was even happier to find that here. Even though there are two main guys, I have to admit I was more of a team Calder person. I don't want to spoil it, but he is my favorite and I want him to be the one who has a happiest ending. There was just a spark about him... I just really adore Calder the most of all the male characters so I am biased when it comes to him. McNulty does a superb job with this speculative fiction, raising questions about allegiance and making the choices best for yourself or those you care about. It will grip you and keep you wanting more. I am looking forward to seeing what will happen next. I just adored this book, and I am sad that I read it so fast but I needed to know what was going to happen. With some many questions and events about to happen, the next book will surely be even better than the first. Of course, I am going to remain loyal to Calder so I can't wait to see how this whole saga will play out! The merfolk and the vampires have lived in relative Ember's life changes drastically when her mother remarries. She always was an only child, but now has to share her home with her two stepsisters. Adjusting to her new life with her popular stepsister Ivy might take some time, but both girls are willing to make it work. In town strange things are happening and there are two boys who suddenly show a lot of interest in Ember and Ivy. Are these boys genuinely interested or are they hiding something? I've read a few other books by Amy McNulty and I really enjoyed them and loved the worlds she could come up with. So I was very happy to receive this being part of her review team! Our two main characters are Ember and Ivy, they've just become step sisters. Ivy the most popular girl at school and Ember the complete opposite lived pretty normal lives until their parents decided to get married and Ivy and her little sister Autumn moved into Ember's house. There's a new boy in town, Dean and a quiet I've read a few other books by Amy McNulty and I really enjoyed them and loved the worlds she could come up with. So I was very happy to receive this being part of her review team! There's a new boy in town, Dean and a quiet jock, Calder that are suddenly very interested in Ember and Ivy. They definitely don't see that these two boys will turn their lives upside down. Will Ember and Ivy be split apart or will they stick together till the end? You'll have to read to find out and you may find that you'll root for your own side. I personally was Team Dean all the way! Calder, seemed like such a pansy to me, while D was a tall,dark and handsome strong gentlemen. You may think other wise though! There's also one other mysterious male in the girls life and I think he was above all my favorite character of the whole story! If you decide to read this I can't wait for you to meet him. All the characters were fantastically written. I believe Ember was my favorite of the sisters because she was definitely like high school me. Both sisters are extremely powerful in their own way though. The author sent me a free copy for an honest review. The premise of the story was original. Mere-people and vampires aren't two supernatural creatures normally paired together. I'm not completely sure it worked, but it was readable and interesting. I didn't mistaken it for another YA Paranormal I've already read. I liked the two main characters but I didn't love them. The two male main characters left a decent amount to be desired. I thought the vampire was a better character but he lacked depth The author sent me a free copy for an honest review. The premise of the story was original. Mere-people and vampires aren't two supernatural creatures normally paired together. I'm not completely sure it worked, but it was readable and interesting. I didn't mistaken it for another YA Paranormal I've already read. I liked the two main characters but I didn't love them. The two male main characters left a decent amount to be desired. I thought the vampire was a better character but he lacked depth of characterization. His stuck in the 40s schtick was a little annoying. The mereman was too cowardly and meek to be a leader or prince. I didn't feel like we got to know him at all. The book suffered from too many minor character introductions, therefore, no one was as three dimensional as they should be. I did not enjoy the POV changes between girls. It ruined the flow of the story and the jumping led to some confusion in a somewhat confusing plot. My biggest flaw is that by the end of the first book, we still don't have a good grasp on why we even need a champion, what the feud or war is about, and the general background of either side. Not great world building set in our normal world. With this being said, I want to read the next in the series just to get more info and see what happens. It was a mediocre start that I'm hoping improves. However, I did enjoy reading about Ember and Ivy. I liked their relationship together and how even though Ivy was always “popular” whereas Ember was on the shyer end of the spectrum, after becoming step-sisters, they seemed to connect with each other fairly well. I also liked how Ivy wasn’t the stereotypical popular girl who is nasty to everyone else beneath her and I also liked how her friends were the same way. They were accepting of Ember and her best friend, Journey. In fact, they all became relatively close at the end 👯. So for Ember and Ivy’s relationship, I actually did enjoy reading about them. Two new Step Sisters, one the 'good girl' Ember & one the 'popular girl' Ivy. Though they're very different they seem like they'll be able to get along without too much of a struggle 👍 Ivy is pleased that Ember seems to genuinely like her baby sister Autumn which helps!! I didn't love this book, I found it slow going. I enjoyed the storyline and I thought the paranormals were a cool & different take. Merpeople and Vampires in this book was a nice touch that I haven't ever seen before. I felt like there should have been more explaining as to the whole idea of accepting the call of champion. I would have LOVED Calder's character if I didn't feel like he was such a weak, pathetic, scared person. It really took away from him. He could have been fairly submissive or quiet without being cowardly. And truthfully I enjoyed the storyline and I thought the paranormals were a cool & different take. Merpeople and Vampires in this book was a nice touch that I haven't ever seen before. I felt like there should have been more explaining as to the whole idea of accepting the call of champion. I would have LOVED Calder's character if I didn't feel like he was such a weak, pathetic, scared person. It really took away from him. He could have been fairly submissive or quiet without being cowardly. And truthfully the vampires were stuck in the old days? IDK it seems a bit farfetched especially the wearing of suits constantly. Maybe a few here or there but not all. Why wouldn't they conform to fit in? Especially when going to highschool? I loved the sunglasses and contacts aspect that was fun. Ember just basically transforms without any explanation of why or how it happened. This book surpassed all of my expectations, and I'm not usually too keen on books revolving around mermaids (probably because they're usually cheesy). I was invested from the first sentence and abandoned my half read library book in order to finish this book and am already looking forward to the next in the series. The characters are realistically written with dialogue that comes across as a conversation someone would actually have. Also, all of the relationships feel natural, and I appreciate th This book surpassed all of my expectations, and I'm not usually too keen on books revolving around mermaids (probably because they're usually cheesy). I was invested from the first sentence and abandoned my half read library book in order to finish this book and am already looking forward to the next in the series. I absolutely loved this book. I read a lot of paranormal romances and I found this to be a breath of fresh air. It is completely original and unpredictable. I loved our MC's and loved that it is in alternating points of view. Since both of the MC's are female it did get confusing sometimes with the smaller details, like who was told what, but overall very easy to follow. I loved this author's writing style and I found everything to be very purposeful. I'm not sure I would write this book any oth I absolutely loved this book. I read a lot of paranormal romances and I found this to be a breath of fresh air. It is completely original and unpredictable. I loved our MC's and loved that it is in alternating points of view. Since both of the MC's are female it did get confusing sometimes with the smaller details, like who was told what, but overall very easy to follow. I loved this author's writing style and I found everything to be very purposeful. I'm not sure I would write this book any other way. I did find that one of the relationships worked for me and the other didn't. I'm not sure if that was the author's intention or my personal opinion, but I will definitely find that out in book two. Overall, such a great first book to a series and I am definitely, hands down #TeamMerpeople! I received this arc for an honest review!! OMG I don't even know where to start!!! This book was utterly fantastical!! I have never read anything by this author but after reading this gem i will be on the hunt for more!! Two stepsisters a vampire and a merman sounds amazing right?? Well it is....Amy has woven a tale with complexity, fantasy and enough intrigue to keep you wondering what the girls are going to do.....if your looking for your next amazing fantasy read look no further then this book I received this arc for an honest review!! A great idea for a story, with intriguing likeable characters. Vampires, merpeople and the ongoing war was a new concept for me and I was looking forward to reading it. The story started out well enough. Adjusting to a new family and the introduction to the supernatural world. Then the story became a little hard to follow. It needed more explanation of the war between the species and why they needed two champions to fight for them. Why these girls and what it was they were expected to do. It just c A great idea for a story, with intriguing likeable characters. Vampires, merpeople and the ongoing war was a new concept for me and I was looking forward to reading it. It just contained too little information for me to enjoy. I thank the author for sending me a free copy for an honest review. This was certainly an original storyline for a book that included both vampires and merfolk. I have to say that this story kept me on my toes during the whole read. I expected none of it and was delighted by the author's creativity with it. I will acknowledge that I didn't really like Ember all that much and found Ivy to be my favorite. I look forward to the next book and seeing how all of it unfolds. I had a blast reading this YA Paranormal/Urban Fantasy Romance. Two warring princes, one a vampire, the other a merman (both incredibly handsome of course), enlist (coerce) the help of two high school stepsisters to champion them in their centuries old conflict. Well written, loads of humor and tension, addresses the difficulties (and benefits) of blended families, and has a very satisfying conclusion. I’ll look for the next in the Blood, Bloom and Water series! I was a fan of Amy’s Never Veil series, and that love has carried over to this new world. Fangs & Fins is a well written, highly entertaining book with characters that you’ll want to be BFFs with in real life. This book touches on family, friendship, love, and so many other things. I highly recommend you pick up a copy ASAP! There were some great lines in this book - full of insight about how people think, but the majority of this book was filler while the author tried to stretch this story into multiple books. Nothing really happens in this book past the first two chapters, and it was disappointing. There is such an interesting framework, but the execution was not that great. I thought this was a very good read that kept one guessing what was going to happen next. I found it had it's share of surprises and look very forward to reading more from this author. Loved it. A totally different style to keep you interested until the end. Easy reading.